D3 Trim+Stairs is a comprehensive set of details for interiors and exteriors. One piece trim objects, stretchable and mitered trim parts in 2D and 3D, conform to the standards of the millwork industry. A cross reference part number guide will aide in selecting the right profile section. 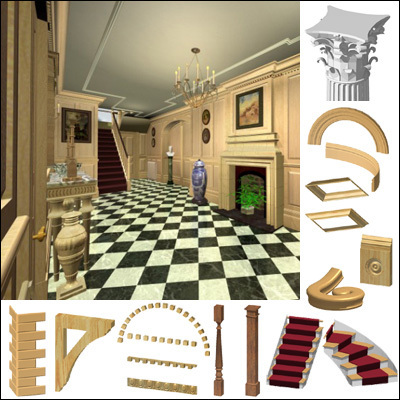 The list is extensive, but easy to use: baseboards, chair rails, crowns, coves, door and window casings, picture frames, corner beads, handrails, spindles, newel posts, columns, finials, rosettes, plinth blocks, and wainscot paneling. A must for anyone who has ever tried to use the wall or slab tool for detailing trim. * NEW quick and easy custom moulding tool to create a profile anywhere in plan and miter both horizontally and vertically. * Classical column can be cut any angle and has two base styles and three shaft styles including flutes. * Straight, curved, spiral and arched trim. * Over 70 standard trim shapes used in a variety of path shapes. * Full miter control for inside and outside corners and vertical angles. * Change trim profile styles without affecting size and orientation. * 3 levels of smoothness. * Trim one to four sides with one only part. * Vertical trim frame with three or four sides for doors and artwork. * Rosettes and plinth blocks. * Stair steps - straight or curve - with optional round nosing and cove and open or closed stair stringers. * 11 Baluster styles, 8 newel post styles, and 15 railing profiles with volute and gooseneck rail ends. * Wainscot with board & bead and raised panels. * Square and turned posts.